Im really liking the tint on this SST40 from both Shenzhen Great Technology and Kaidomain. Im not really a fan of colder tints but these turned out surprisingly nice. It has a pinkish white tint compared to the blueish Cree (cool white) emitters. I have them DD’ed in a Convoy C8 and it is performing really well. Very happy with them. I’ve experienced the same. Very nice uniform beam and tint. It’s not nice as in pure white. It definitely has a tint but as was said this tint is a pale purpley tint. Hard to describe as it’s not the normal led tint we are used to. Has anyone thought about sticking dedomed SST-40s under carclo 10 mm optics? For example with Emisar D4. It wont be much brighter when de-domed. Hard to notice by eye and only at super high currents for a few seconds (20+A with three LEDs). Xml2 T6 shows almost the same result as highest bin xpl it is a bit strange. Xml u4 then will be best emiter. I don’t really agree. I think if you want maximum output the SST-40 is the best from 3V emitters. Watch my numbers in the Convoy C8 section. That's a great chart ZozzV6! Very useful for comparisons. Really like the SST-40 beats the XPL2 V6, even at less amps! And the dedoming, like you said, doesn't lose much in lumens, but still nearly doubles the candela. Wow! I gotta order some more!! Have 3 on the way. Thanks A Bunch for the meticulous work!!! Half of these lights are one of my friend’s property. And I don’t own 12 C8 at the same time I build some of them for request. And for the SST40 tests I replaced the leds and drivers in my grey c8 which earlier had the xp-l2. I wanted to see what mod worth the effortand what led is the best for a specific purpose. I know that I had to try them all but now I can refer things to people if they had idea for a special flashlight. Higher current means the battery sags faster, so the current is reduced faster than at lower currents. Also the light gets hotter. Correct. Hotter, less efficient, but with higher peak brightness. My 219c D4 is not too hot with VTC6. SST-40 has higher Vf curve, so it wouldn’t be too hot with this battery either. Can’t wait for those VTC5As to arrive…. Lots of work there Zozz. Thanks for sharing. I have XML2 U4 dedomed 30+pcs. and SST40 dedomed 20pcs. from KD. Set up in C8 , A17DD , AR lens. Thanks for sharing. I was just wondering has anyone tried a dedomed sst40 in a c8 yet. And hours later, I see your post. That’s great numbers. I’m loving the sst40 more and more. I need to get me one. Chunky multi cell lights are different story and they could really benefit from it a lot. I’m getting 172,000 cd from sst40 in an olight sr52. Not dedomed:) So far its lasting but not sure how long it will. I just finished modding my old Thrunite TN-31 from XM-L2 U4 to a SST40 I purchased from KD, the difference is very noticeable! The resistors on the TN-31 have been bypassed so it’s pushing more amps to the led, on ceiling bounce eye test it is almost the same brightness as the XHP-35 HI on Brightest setting of my Acebeam K70, it is definitely pushing a lot of lumens! Very happy with the mod! I do have a convoy l2 with the sst40 dedome.. it put out 1600 lumen and 280k lux… This light doesn’t get warm or hot at the high mode after 5 minutes.. I am doing more temperature testing tonight… I can tell you this light have a great heatsink..
On the bright (haha) side, with a lower Vf, it’d stay in regulation a bit longer in a 7135-based light as the cell depletes. Couple of things to note; my multiplier for the sphere could be slightly off, but I used the same one in both tests. I believe I measured the lux back several years ago, and saw closer to 500kcd when I took the reading at 6 meters. Just for kicks, I tried some 30 Q’s to compare to the protected 3400’s I did the tests with. The results were as I expected, no change. I ordered 3 SST-40 LED’s from Shenzhen Great Technology. When I opened the sealed bag I saw they all had bubble-shaped inclusions. Some more visible than others. In the left side LED: multiple incusions on the right side, near the leads. In the middle LED: a small inclusion a bit right of the middle. 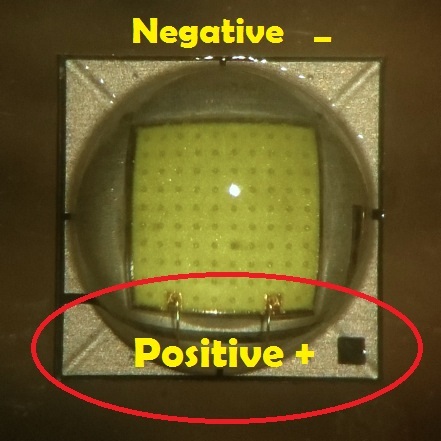 In the right side LED an inclusion on the far left side, but this is NOT hovering over the phosphor layer. Now a larger picture of the LED on the right side. The LED is 180deg rotated, so the inclusion is now on the right side. Are these LED useable, or are they just an accident waiting to happen? Sorry for my inability to take macro pictures.